revimac: Strivers and skivers in the pursuit of Christian excellence? Strivers and skivers in the pursuit of Christian excellence? There's a lot of right wing spin flying around at the moment stirring the public perception that of those many who are on benefits a third are making fraudulent claims. 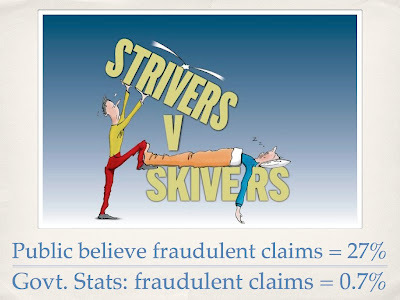 Though the Government's own statistics reveal the figure to be closer to 0.7% the mere mention in church circles of the word 'skiver' puts many a Christian into a tailspin as they rush to distance themselves from what is an 'elitist' insult. But the reality is that many of us see the church as prime territory for half-baked commitment in the pursuit of excellence. There are plenty of churches with strivers, plenty more with skivers. "Ouch, that hurt...after all, us over worked members have to balance busy jobs with leisure, family and friends...that you get us to volunteer anything at all should make you grateful." So many church leaders struggle to inspire their members to achieve anything looking excellent. Just as our Youth Clubs have second-hand-me-down donations of Table Tennis tables and dump-diverted-sofas, so too it is true of the allocation of gifts and time to the church. There's an attitude in so many of our churches that because it's our voluntary contribution, it can fall far short of the excellence and commitment we would strive in the workplace. I notice that people are far more likely to volunteer when the church rottweiler is recruiting than when we try to persuade people gently, begging the question as to how many members volunteer out of fear than through having a genuine passion to serve? And therefore are we cherry picking just those ministries and activities that give us the easiest gratification and other's we endure to avoid the rottweilers gnashing of teeth? Where is God in all of this? Are we serving the rottweiler, the church leader, or God? I don't want my church to be actively striving towards excellence so that I can boast 'my church's' excellence' I want God's church to be serving God in response to the mercy and grace he has shown us through the death and resurrection of Jesus Christ. That deserves our complete commitment. It demands the priority of everything we can give through an existence of sustainable work-life balance that places God at the centre. That's the driver for the striver or else it's the diver of the skiver. That should raise a passion within us that pursues ministries that strive for excellence. Indeed, we should therefore strive for excellence in everything we commit ourselves towards. From a Biblical perspective, excellence is a virtue and we should pursue it at all times. Whether we’re washing coffee cups after the church service, running a business or running to get fit, we’re called to please God through our efforts. “Whatever you do,” the Apostle Paul tells us, “do it all for the glory of God” (1 Corinthians 10:31, also Colossians 3:23-25, Matthew 25:14-30). Sadly this pursuit has much been eclipsed by more celebrated virtues like love and joy and forgiveness. My training incumbent was always banging on about aspiring to excellence—our very best. At the time I felt it was leaning towards protestant elitism but the more I minister in church leadership the more I realise it was simply trying to enable people the greatest sense of fulfilment by achieving the fullest potential God has for our lives...all of us paid and unpaid, clergy and laity...and what motive? Not because of my nagging at people to give of more more of themselves but because GOD has given us the privilege to do those things and who are we to offer Him any less than our true best? Strive is the word I want to claim back from accusing Tories against skivers and put it back in it's rightful place in our role to strive consistently toward our potential, toward the goal of doing things as well as we can, no matter what we’re being paid and no matter what anyone else is doing (or isn’t doing). The results of the summer's Olympian gold medal performance achievements bear good testimony of what can happen when a bunch of strivers get together and believe in their potential for excellence. And boy when we’re in the presence of such excellence, it can be an emotional experience. I went with friends for a meal recently at restaurant in Taunton...but the excellence of the food and service was so amazing we were just lost for words. We could only muster the occasional “Wow!”. Imagine what it would be like if our church visitors, church regulars, our friends and family, our work colleagues and customers felt that way about our efforts! The legacy hoped of the Olympics was that excellence would inspire the next generation of athletes, that they would be 'wowed!' realising their potential... pushed to go beyond themselves in the pursuit for excellence and realising their God-given potential. But let's be aware of the elephant in the room of 'Striving in the Pursuit of Excellence': 'Pride'. Sometimes the pursuit of excellence among Christians is not borne of St Paul's teaching on boast-less, Christ-modelled and centred, humble service and a genuine love for God, but out of self-elevation in the pursuit of social respect and gain. Some people will use the right words – “my church (school, business, product, band, choir…you name it) belongs to God and is striving for excellence, so don't knock it” – but the real motive is their concern about their reputation. A warning for all of us in church leadership is our willingness to browbeat people in the name of “Christian excellence” not for the gain of the Kingdom, but for one's own reputation. Pride should never be the driver of our pursuit to strive for excellence. Pride is one downside of excellence. At the end of the day, what is our motivation? Is it really about God, or is it about you? Burnout is a second downside, albeit not necessarily a sinful one. Habitual striving can be exhausting, whether we’re personally striving to achieve our potential, or striving for our organisation to excel, or even striving to have the best possible marriage. There comes a point where the pursuit of quality over-stretches us and perhaps those around us. At that point, excellence again morphs from virtue to vice. Many of us have felt overworked and we understand full well how harmful that is to our health, to our relationships and, critically to our spiritual lives. I very quickly learnt that lesson here in Priorswood. I made up for what I considered to be the shortfalls of my gifting as a leader... the 'how did I get away with bluffing it this far' thought... by overworking to fill the gap. This grueling, joyless and often prayerless existence, along with all of the accompanying repercussions, nearly finished me and convinced me that I needed to make significant changes. Excellence needed to be bounded by simplicity, a focus on doing just a few things and doing them as well as I could. I focused more on the areas where I truly felt called, even if that meant I constantly heard 'well the last Vicar always visited...did this...achieved that....' Indeed, we ought to pursue excellence, but that requires discernment and sometimes, tough choices. Better to do a handful of things at 100 percent than many more things at 70 percent. Trying to do the latter at 100 percent quality (as I was trying to do) is not a healthy existence. Neither is it the life God invites us to live. What excellence constitutes for you is not really for me to say. It's between you and God, but in matters concerning church, it should be the church leadership that helps you to not only discern the destination of your pursuits in ministry but then also to help you and follow the right direction of them. Just to shoot off on your own Christian pursuits is a sign of both Christian immaturity and probably the doomed pursuit of self-elevation. In the pursuit to strive for excellence it's important to focus more on the process than the product. It’s wrong to think of excellence as merely a destination. When we do, we risk complacency and stagnation once we’ve allegedly reached a point we consider “good enough.” I'm finding that with my diet. The commitment and excellence of achievement (of a sort) has been in the journey not in the destination. It’s wiser to think of excellence as a direction, a disposition, a striving toward something better, toward the next level of quality, toward continuous improvement. In that way, the focus is not on the product of our efforts but on the process of pleasing God by stewarding the talents and resources He’s entrusted to us. The endeavour remains about Him, rather than about us, so the striving can naturally remain an ongoing, faithful process. Excellence, then, is not an act, but a habit. In other words, excellence is more about becoming than being. It’s a direction more than a destination—a way of life and one that we Christians need to reclaim as our way of life.